Mobile Physician Services staff members have a mission and vision to care for the Medically Underserved, both at home and abroad. Nicole Deboskey, Psychiatric Mental Health Advanced Nurse Practitioner is the latest Mobile Physician Services staff member to donate her time to helping others abroad. 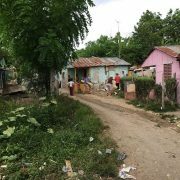 In late June, Nicole and a team of fellow relief workers boarded a plane and headed into the heart of The Dominican Republic to provide help to those in dire need. Situated in the beautiful waters of the Caribbean, The Dominican Republic (aka the D.R.) has had a tumultuous past. Initially inhabited by the Taino, the island was claimed in 1492 by Christopher Columbus and named Hispaniola. Valued for its rich natural resources of gold, silver, marble and other previous stones, the island has faced centuries of military coups, invasions and political turmoil and corruption, leaving many of its inhabitants impoverished, and without consistent medical care. 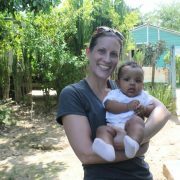 Nicole and her team were able to not only provide medical support, but were able to help with housing and sanitation efforts to the villagers who welcomed them with open arms and grateful hearts. The Medically Underserved are a Global Concern. Often when we think of “medically underserved”, countries like The Dominican Republic, Guatemala, Honduras, and other parts of Central and South America spring to mind. The truth is that right here in Florida, we have thousands of people who have little or no access to their physicians, and go without the care that they need. Since its beginning, the goal of Mobile Physician Services, and its caring Providers like Nicole, has been to care for those people who would not otherwise receive care. How Mobile Physician Services is reaching those in need. This year, in addition to being recognized as A Patient Centered Medical Home by NCQA, Mobile Physician Services has expanded its reach and services by offering Wound Management and has added a Psychologist to our team. Mobile Physician Services now serves 21 counties across the state and shows no signs of slowing its growth.